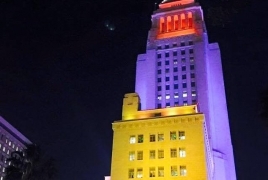 PanARMENIAN.Net - Los Angeles City Hall was lit up in Armenian tri-color on Wednesday, April 13, in view of the recent violence, unleashed by Azerbaijan against Nagorno Karabakh, Asbarez said in a Facebook post. Besides, a candlelight vigil in memory of Karabakh’s fallen soldiers was organized in front of the building. The Armenian side has suffered 74 combat losses, 122 more were wounded. One soldier is still missing.